You know a book is a little out of touch when you add it to your Ravelry library and only one of the patterns has been entered into the database. Hopefully I can do this book justice in this review! Knit One by Angela King was published in 1983, the year that I was born. It is only fitting that Keith picked up this book for my 31st birthday at a used book store. (He paid by the pound!) You can tell just from looking at the cover photo that this book is going to be a tapestry of dated fashion. "Whether easy or more difficult, however, the patterns are all stylish, modern and attractively presented." This is not a how to knit book, but there are some tips ("Some Useful Advice") at the beginning of the book. Five pages later we're ready to start looking at what 80's lovers can only dream of... the patterns. Snakeskin - Who wouldn't want to create a gold sequin jacket? You can't even tell that this is a knit! And did they really travel to the pyramids to take modeled shots for this book? Foxy Lady - a really lovely intricate cabled sweater dress. I wish that I could predict more about what it actually looks like, but since the sample is in white you cannot see the cabled details too well in the photograph. Plus the model has her hands in her hair, so it makes it hard to see how the garment hangs. Ultimately I think it is lovely and could have promise, although I shudder at following all of these cables in written instructions. If I were going to make this (I'm not) I would translate it to charts almost immediately. Beginners Luck - "Hardly any shaping makes it very easy to knit" I think "hardly any shaping" could be the slogan of the 80's. Some of the other patterns could be more classic if styled a little differently. There are is a cabled vest (School's Out) and many aran sweaters (Carved Ivory, Collette) that could possibly still fit into someone's wardrobe. Make sure you keep an eye out for poofy shoulders, though! Many of these patterns are fairly dated and they are certainly not written for beginners. Each pattern is kept to a single page and there are no charts. I am feeling spoiled by the ebook pattern industry now! Normally when I look at book patterns I want to see multiple pictures to understand what the garment is like and clear instructions. This book provides neither, but part of the value of the book is looking at the crazy styling choices. I hope you enjoy the sneak peaks I've provided in this post. "Now fashion conscious women can have the satisfaction of creating stunning hand knits for themselves, and for a fraction of the price such designs would cost in the shops." Oh how things have changed. I don't think that any knitting designer today would say that you could create knit fashions for CHEAPER than what you could get in the shops. To replicate a high end sweater would cost hundreds of dollars in yarn before even taking into account labor. I love books like this. 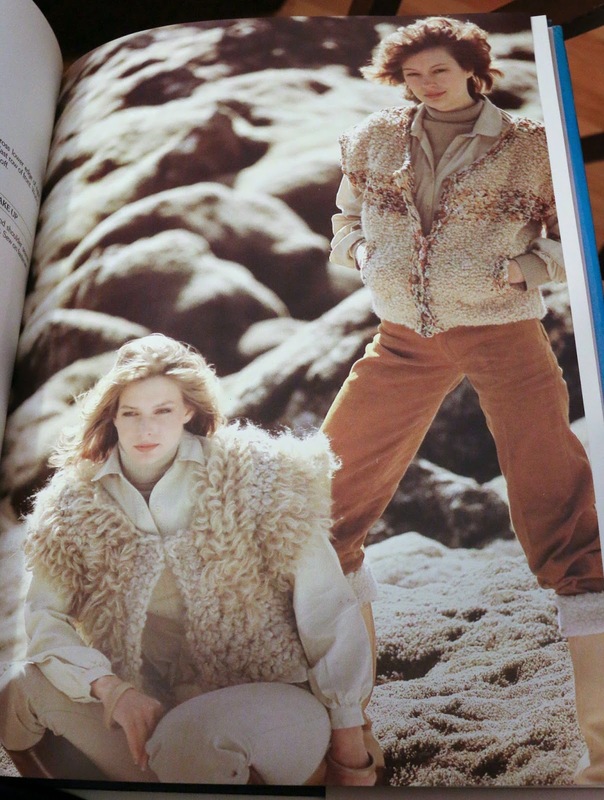 I just picked up vogue knitting from the 80s at a second hand shop. It has some fantastically ugly things in it like a "cutting edge, trendy" gingerbread man applique sweater.